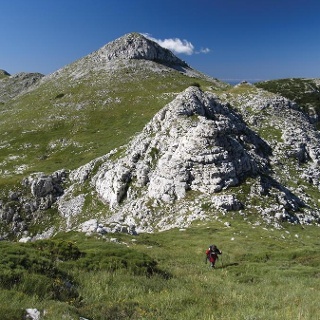 Behind the Brezovac mountain hut, the marked trail continues to the peak of Dinara – the highest peak of Croatia. In 20 minutes, we reach the edge of the meadow called Duler, continuing from that meadow to the wide meadow of Samar. A wide path ascends along Samar for a considerable amount of time, until we reach a flatter section where the markings turn to the right, taking us uphill as we leave the forest road. Along steep meadows, we reach the first forest section, where there is a path to the right leading towards Mirkovići. 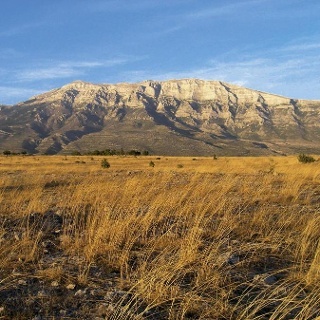 This is where our route reaches predominantly rocky terrain and gradually ascends through it, with wide views around. What follows is a somewhat steeper couloir to the place where we can see the geodetic pillar at the top. 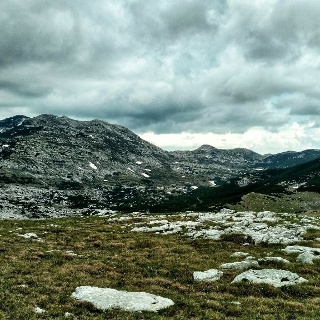 From there, it takes further 10 minutes of hiking to get to the highest peak of Croatia (1831 m.a.s.l.). On the other side, there is a marked hiking route leading from the village of Glavaš to the peak of Dinara. We will use that route to descend to the source of the Cetina River. By descending across Zelena strana, we reach Razvale, with an old access path from Uništa to our left. The markings take us further across the grasslands of Lavudrovac. Next to the main path (after we cover approximately one half of the route), there is an open mountain shelter called Martinova košara in the shepherds' settlement of Donje Torine. What follows is a descent along open terrain to the ruins of a medieval hill fort of Glavaš. After 20 more minutes of hiking, we reach the village of Glavaš itself, with a mountain hut (blue container). Yeah! Dinara, I like her. The cystern at Brezovac was locked (there was no one at the hut). The next watersource is after the top at the shelter. A little way doen the trail at a 1000meter there's a spring with ice cold water.